Outside the context of the expansive (although not always universally inclusive) Star Trek universe and its many iterations as originally and thoughtfully conceived by Master Gene Roddenberry, Star Trek Into Darkness is a well-paced, well-performed, occasionally compelling, but often redundant summer action movie. The J.J. Abrams brain trust (Damon Lindelof, Alex Kurtzman, Robert Orci) are on their game – the storytelling is considerate in conception (though not always in execution), lens flaring occurs, and Michael Giacchino does his thing scoring the action – but like the worst moments of Lost or of last summer’s Prometheus (also scribed by Lindelof), there is too much focus devoted to pleasing the fanboys and girls and too little focus to making the best possible stand alone movie. Inside the Stark Trek world of TV shows, movies, books, and dress-up conventions (I have been but a casual peruser over the years, not a true devotee), Star Trek Into Darkness is an average and uneventful Star Trek iteration that relies too heavily on the mostly empty allusions (Was a repeat of this really necessary?) to the past (but ironically future events in the timeline of the Kirk, Spock, and Co. narrative). Yes, I enjoyed Karl Urban’s borderline caricature portrayal of Bones, but Doctor, please treat the screenplay’s a dozen too many uses of “Damn it, Jim!” You will get more out of Star Trek Into Darkness if you have trekked a few times before, but if you have trekked before, you will be disappointed that you didn’t get more out of this installment. Spock is just an outstanding character and Zachary Quinto could not execute a better performance. It is not easy to consistently nail the stoicism of this largely emotionless Vulcan yet simultaneously instill so much humanity. Quinto manages to do both with an apparent ease. I do wish there was more Spock speaking, considering, and deciding and less Spock fighting in entirely unnecessary climactic battles set against entirely unnecessary large set pieces. It is obvious that Benedict Cumberbatch (delightful and brilliant as ever) plays the bad guy in this movie, but his character’s true identity had been cloaked in old school, spoiler-alert proof M. Night Shyamalan secrecy during the endless prerelease press junket. If you haven’t already heard who the artist sometimes known as Sherlock’s alter ego really is, let me tell you a secret: when you find out, it really doesn’t matter (and maybe it matters even less for devoted fanboys when all is said and done). The (we were made to think) big reveal is already listed correctly on the IMDB character page. (As a point of comparison, IMDB still lists Kevin Spacey as portraying Roger ‘Virbil’ Kint in The Usual Suspects.) According to the Final Frontiersmen who will actually care about the true identity of John Harrison (as he is introduced when the movie begins), the Cumberbatch character in this movie was more interesting and compelling enough before the reveal and did not need to become mired in an ultimate and inevitable lackluster and unmaintainable comparison to an original version. This part is another win for Cumberbatch, but his character’s inclusion is likely a slight loss for Stark Trek Into Darkness. To both the strange world of its most passionate fans and to the new world of the audience on a summer blockbuster viewing voyage, Star Trek Into Darkness does not boldly go where no movie has gone before. Although it may entertain through a modern action movie lens flare, it does not have a deeper impact. Iron Man 3 accomplishes what it set out to do: to provide escapist, somewhat smart, summer action entertainment in the style and scope of the modern Marvel brand (see: Iron Man 1, The Avengers, Thor) and box office behemoth. Robert Downey Jr. remains his ever enjoyable pithy deliverer of witty hubris, his toy collection and personal AI butler, Jarvis (Paul Bettany’s best work since A Beautiful Mind), is even more on (and really over) the cutting edge, and the action sequence direction has been seamlessly passed on to the more than capable hands of Shane Black who knows a thing or two about writing action movies (Jon Favreau was given the opportunity to exclusively focus on his acting chops as Happy, the one man wrecking ball of Tony Stark’s human security detail). Although the box office ceiling may have no bounds (WOW! ), the quality of movie ceiling is an enjoyable two hours of entertainment that will provide a worthwhile distraction that lasts only as long as the lights are dim in the theater. Sure, there may be some continuity benefit to having seen Iron Man 1 and Iron Man 2 and last summer’s The Avengers, but the serialized storytelling stakes are just not that high (I honestly barely remember any of the previous films or think they are necessary to understand a bigger Tony Stark character study). Your Iron Man 3 experience will not be lessoned if this is your first movie from the Marvel film factory. 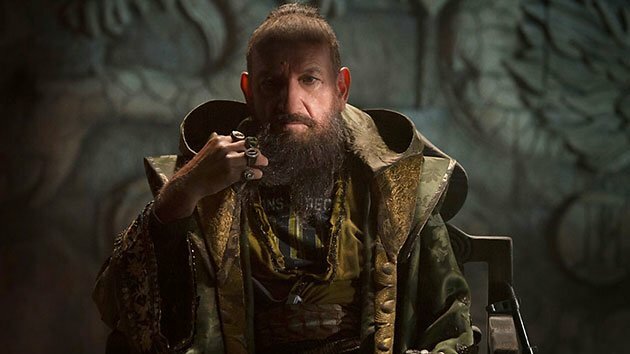 If you have seen promos or trailers for Iron Man 3 (I admittedly mostly tuned them out each time they come up this past winter and fall), it would have been hard to miss the ethnically ambiguous main villain, the Mandarin, played by Sir Ben Kingsley. I was skeptical of how this highly ornamented, time period confused, and seemingly lesser than bad guy would work. Not only is Ben Kingsley my favorite part of Iron Man 3, his character may be my favorite and most unexpected creation in a Marvel Universe movie since all that was 2003’s exceptional X 2 (Iron Man comic book fans are apparently not as pleased with this Mandarin depiction that strays quite far from the source material). This unorthodox version of the Mandarin made Iron Man 3 that much more fun. On a semi-related note: I love how Robert Downey Jr. and Ben Kingsley bonded over their mutual admiration for Sir Richard Attenborough. I also love how Sir Richard Attenborough has come up in the last two “5 Things You Need to Know” and the year is 2013. There is a post-credit scene at the end of the movie that, after a much too long closing credit/end titles sequence, is not worth staying for. Whatever fleeting momentum the movie provides is lost by the time you get to see Tony Stark one more time. For those of you who see this post-credit scene as an essential component of the Marvel movie experience, this scene is clever and even a bit comical, but does nothing to further connect Iron Man 3 to the greater Marvel universe. Despite record-breaking domestic and international box office returns, Iron Man 3 is not a pop culture moment, a cinematic touchstone, or even a “I have to see in theaters in order to hear what all the fuss is about” summer blockbuster. Iron Man 3 is unapologetically an enjoyable escapist movie sequel that keeps you entertained and satisfied. I have seen it, I had some fun, and now, like most other Marvel universe movies, I will soon forget about it.